Israeli soldiers injured, Friday, many Palestinians in Bab az-Zawiya area, in the center of Hebron city, in the southern part of the occupied West Bank. Media sources said the soldiers attacked dozens of Palestinian protesters by firing a barrage of gas bombs and concussion grenades at them. They added that the soldiers shot a young man with a rubber-coated steel bullet, and caused dozens to suffer the effects of teargas inhalation. Palestinian photojournalist, Mos’ab Shawar, said the soldiers attacked and clubbed him, in addition to shouting insults at his colleague Mousa al-Qawasmi. 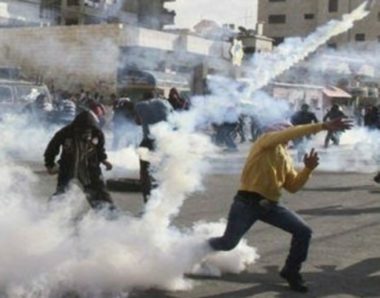 In related news, the soldiers attacked the weekly nonviolent procession against the illegal Annexation Wall and Colonies in Bil’in village, west of the central West Bank city of Ramallah, causing many protesters to suffer the effects of teargas inhalation. 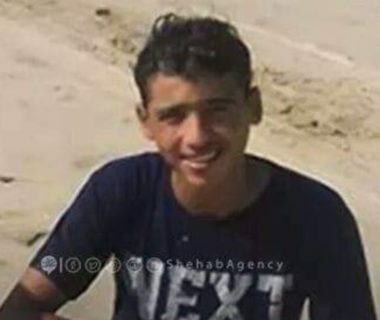 The soldiers also killed a Palestinian child, identified as Maisara Mousa Abu Shallouf, 15, and injured dozens, during the weekly Great Return March processions in the besieged Gaza Strip. WEST BANK, PALESTINOW.COM — Israeli soldiers abducted, Thursday, at least fourteen Palestinians from several parts of the occupied West Bank, and continued the closure imposed on Azzoun town, near Qalqilia, for the fourteenth day, the Palestinian Prisoner Society (PPS) has reported. Days Of Palestine [ Gaza ] – Israeli occupation forces (IOF) have once more opened fire on Palestinians who took part in the 54th Friday of the peaceful protests “Great March of Return” along the border between the besieged Gaza Strip and occupied territories, killing a child and injuring at least 66 others. The Ministry of Health reported that Israeli occupation snipers shot one child and injured 66 others including two paramedic volunteers in the 54 th Friday of the peaceful Great March of Return, east of Gaza. The child Mysara Musa Ali Abu Shalof, 15, was was shot in the abdomen, east of Jabalia, the Ministry Of Health affirmed. According to medic sources that at least 15 children and 6 women were among the injured. The spokesperson of the Ministry of Health added that the volunteer paramedic Kamal Al-Shahri severely suffocated during his humanitarian work, east of Khan Younis. In another statement the Ministry of Health reported that the volunteer paramedic Bilal Abu Foul of the Palestinian Red Crescent Society (PRCS) was hit with a tear gas canister in his hand during his humanitarian work east of Jabaliya. Meanwhile the Higher National Commission of the Great March of Return said that the march will continue until achievement of its goals in full. Since the beginning of the Great March of Return and breaking the siege on 30 March, 2018, at least 271 were killed and more than 16,656 were injured with different injuries by the Israeli occupation forces.